Car makers say they’re under increasing pressure to fit more equipment into cars. We take it for granted that they’ll have electric this and power-assisted that, in addition to air-conditioning and entertainment systems. All this kit takes up space. Throw in that petrol-electric hybrid cars frequently need the area under the boot to fit the petrol tank (the batteries now go where that usually lives) and in some cars there is simply no room for something that may never be used. Why do drivers like them? It’s undoubtedly reassuring to know that if you get a flat tyre, you can continue your journey with only the minor delay that a smooth wheel change can incur. But according to Continental, drivers who think that could be labouring under a misconception. The tyre maker claims that only 70 per cent of spare tyres are ever fitted when required. This is because many are underinflated, otherwise not fit to be used, or the driver can’t get the wheel off to change the tyre. How do puncture repair kits work? The kit includes a latex sealant that is forced into the tyre through the valve and a compressor. This runs off the car’s 12-volt power outlet and inflates the tyre. The theory is that the sealant will plug the hole when it’s put under pressure, enabling you to get home. Obviously weight and space weigh heavily on their side. These repair kits weigh a fraction of the 20kg a full-size spare wheel tips the scales at. And as they’re about half the size of a car battery, they take up a lot less space than a wheel. According to Continental, they will offer a temporary fix for four out of five punctures. And they will enable you to do 300-400 miles, thereby safely getting you off the roadside. Not having to mess about with a jack and wheel brace is a bonus too. For every one in five flat tyres they don’t work. For example, if you hit a kerb and cause significant damage to the sidewall of the tyre a repair kit won’t do the job. 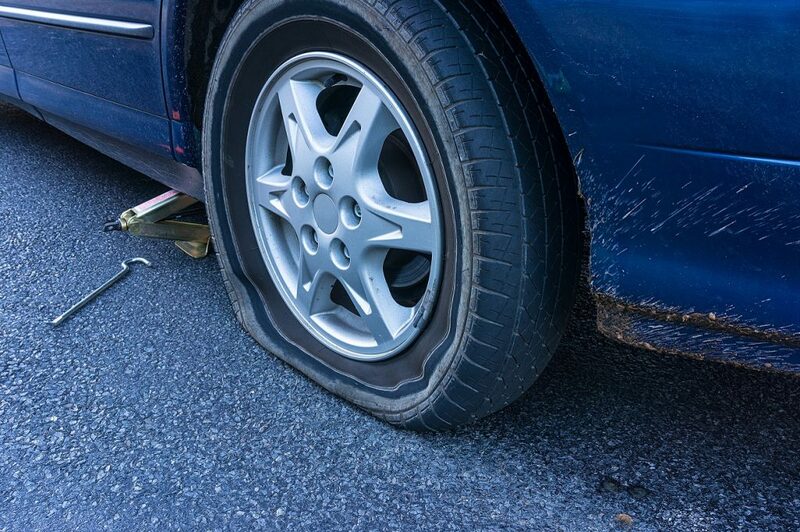 And if your tyre suffers a sudden structural failure – more commonly known as a blow out – they certainly won’t help. In addition, the inside of the tyre and wheel will be covered in a mousse like substance. Although they can be cleaned and repaired, contrary to what some say, many fitters will refuse because it’s such an unpleasant job. Around 25 per cent of new cars come with space savers. These are skinny wheels designed, as the name suggests, to cut down on the amount of room a spare takes up. Of course you still have to change the wheel. And once the space saver is on, your speed is limited to 50mph and range limited frequently to 50 miles, for safety reasons. On top of that, there’s every chance that the full-size wheel with the flat won’t fit in the spare wheel well. These are also known as self-supporting tyres because they use the rigid sidewalls rather than air pressure to support the car if they’re punctured. Of course, you don’t have to change the wheel. And they’re so effective at disguising a puncture that some drivers have had to rely on their Tyre Pressure Monitoring System to discover their tyre had lost air pressure. However, the downside is that the ride can be on the firm side with these because of those rigid sidewalls. Are self-sealing tyres the future? Spare versus repair? Let’s be honest, every one of these solutions feels like a compromise. But probably the best answer is the self-sealing tyre. However, there are still downsides. In this case you’re likely to pay a bit more for tyres that mend themselves. Whether that’s a worthy price for the convenience of never having to change a tyre again is a personal choice. When it comes to deciding between a spare wheel, repair kit, or self-sealing tyre, I honestly think it comes down to personal preference. There will always be downsides to whatever method you choose. I’d assume that people would be aware of those shortcomings when they choose that method. Full size spare wheel for me. I purchase a spare will each time I change my vehicle if they don’t come with a spare wheel. Doing away with a spare wheel is cost saving at it’s most dangerous,shame on car manufacturers. I think it’s more to do with shape/style/fashion that they can’t fit a spare wheel. My spare wheel is on the outside of the vehicle, not ideal because it makes the back door quite heavy. But I’d rather that than “no” spare. Have dealt with 2 punctures in the last 3 years (2 different vehicles) one on sidewall the other on corner of tread. Sealant was useless on both instances. I bought a spare for my Touran, which now remains in the bootspace. An inconvenience well worth it for peace of mind.